Barracuda is an on-demand cloud ecosystem currently used by approximately 150,000 users around the world, most of them Barracuda products users which needed an extra layer of scalability and protection. Currently, Barracuda Cloud is one of the most popular and rare systems that provide both on-premise and SaaS control over digital information for business from all scales. The product is priced on quote basis, and integrates perfectly with the rest of Barracuda’s productivity suite. So far, Barracuda Cloud proved to be a great solution for the retail, health care, legal, governmental, and educational sector. As an advanced IT management system, Barracuda Cloud offers a variety of monitoring and operational features, including electronic signing, file sharing, web security, intrusion protection, application control, and secure remote access. It can boast with impeccable network performance regardless of the numerous content security functions, and it offers automated updating and maintenance to ease at least some of your IT team’s daily tasks. Barracuda Cloud has three essential modules: Continuous Threat Protection, Secure Storage, and Centralized Management, all of them automating resource-intensive security tasks, and easing performance and filtering web content to the cloud. Once you’ve installed it, you get remote access to your data, and the ability to monitor your network and configure security policies in accordance with your business rules and operations. Companies purchase it as an additional security layer for their corporate data and operations, including their email communication and documents signed using the products’ e-signing functionality. Backup within the system is automated, and can be triggered even offline to ensure protection in all cases. As the business grows and develops, the product is automatically updated and can be configured inexpensively to cover every newly introduced operation. In fact, Barracuda Cloud is one of the rare systems that actually help you stay ahead of risks and prevent threats, as it offers a permanent Barracuda Central subscription thanks to which you can have your network monitored 24/7. The elastic cloud computing feature offloads CPU-Intensive tasks of web content filtering, empowering low-latency network security which stops threats before they’ve even reached your data. Storage is secured through the seamless connection to Barracuda Message Archiver, which stores your emails in cloud in case your local server becomes unavailable or your mailbox has reached its maximal storage capacity. This makes Barracuda Cloud an all-in-one web-centralized platform where you can securely access and manage all of your data, security policies, reports, and communications. If you are considering Barracuda Cloud it could also be sensible to examine other subcategories of Best File Sharing Software collected in our base of B2B software reviews. Every company has different requirements and needs a software that can be customized for their size, kind of workers and customers, and the particular industry they are in. For these reasons, no software can proffer perfect functionality out-of-the-box. When you look for a software product, first be sure what you want it for. Read some Barracuda Cloud reviews and ask yourself do you desire basic features or do you want complex tools? Are there any industry-specific tools that you are looking for? Get the answers to these questions to assist your search. There are lots of aspects that you need to mull over and these include your finances, specific business requirements, your organization size, integration requirements etc. Take your time, check out a few free trials, and finally select the system that provides all that you require to enhance your company competence and productivity. How Much Does Barracuda Cloud Cost? Barracuda Cloud’s enterprise and SMB pricing information are available upon request. Contact the company and share your details to obtain your personal package. We realize that when you make a decision to buy File Sharing Software it’s important not only to see how experts evaluate it in their reviews, but also to find out if the real people and companies that buy it are actually satisfied with the product. That’s why we’ve created our behavior-based Customer Satisfaction Algorithm™ that gathers customer reviews, comments and Barracuda Cloud reviews across a wide range of social media sites. The data is then presented in an easy to digest form showing how many people had positive and negative experience with Barracuda Cloud. With that information at hand you should be equipped to make an informed buying decision that you won’t regret. 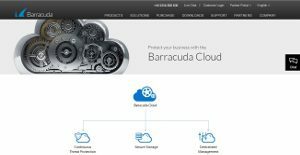 What are Barracuda Cloud pricing details? What integrations are available for Barracuda Cloud?